2017 is shaping up to be a big year for Star Wars fans across the globe. Not only did Rogue One have an incredible run in theaters around the start of the year, but also, we recently celebrated Star Wars Day on May 4th (May the Fourth be with you!). And who could forget our first look at the upcoming Star Wars Episode VIII – The Last Jedi? With an ominous subtitle like “The Last Jedi,” it’s hard to say what’s in store for our favorite force wielders on the big screen. 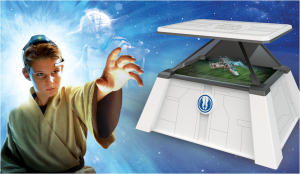 What we do know for certain, however, is that thanks to our EEG headsets and the out-of-this-world Force Trainer II: Hologram Experience game, we won’t need to travel to a galaxy far, far away to train our young Padawans and Jedi Knights right here on Earth! With The Force Trainer II, Star Wars fans have the opportunity to train just like real Jedis! By focusing their minds and going through training exercises, students of the force can learn to control the movements of tablet-projected holograms. As you train in the ways of the force, the challenges increase. Along your path to becoming a Jedi Knight, and eventually a Jedi Master, you will have the opportunity to battle droids, levitate X-Wings, and dive head first into the universe of Luke Skywalker, Princess Leia, Darth Vader, and more! Of course, to train in the ways of the force, you need a teacher, and The Force Trainer II offers the best there is—Yoda! As you prepare your force powers of concentration across 25 levels, you receive guidance from the legendary Jedi Master. With over 800 years of experience training in the ways of the force, you can bet he has a lot of advice to give young Padawans! You can get your very own Force Trainer II and begin your Jedi adventure here. Continue your EEG journey with a brainwave sensing headset such as the MindWave Mobile or the BrainLink Pro from NeuroSky. When worn, an EEG headset measures your brainwave signals and interprets the information gathered to interact with an app. Based on your levels of focus and concentration, the brainwave sensors on your EEG headset will allow you to interact with many more exciting brainwave enabled apps from the NeuroSky Store. You can purchase the MindWave Mobile here, and the BrainLink Pro here. With The Force Trainer II and an EEG Headset, the Next Rebellion Begins at Home! EEG headsets have taken something that previously could only happen a long time ago in a galaxy far, far away (such as moving things with your mind) and transported it directly to your living room. With The Force Trainer II, Star Wars fans have an opportunity to embrace the force like never before—honing their skills and rising through the ranks of the Jedi to become a true master. Choose between the dark side or the light side and shape the future of the galaxy, all without leaving your home! 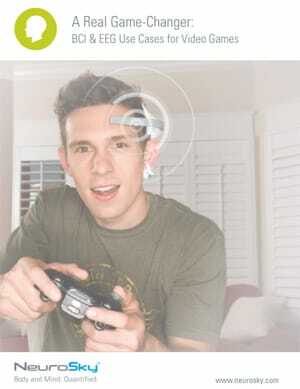 To learn more about how EEG headsets are revolutionizing the way we play games, download our free whitepaper, A Real Game-Changer: BCI & EEG Use Cases for Video Games. And remember, may the force be with you.